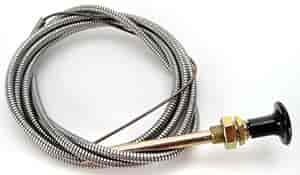 Trans Dapt 2332 - Choke Cable Kit Length: 6"
RPC R2332 - Choke Cable Kit Length: 6"
Made of sturdy solid inner wire with a wound steel outer spring shroud. 6' long and can be shortened to any length. 2078 - Mr. Gasket Hand Choke Cable is rated 1.0 out of 5 by 1. Rated 1 out of 5 by amtronic from Missing key part When I received this part, it was missing the mounting nut that screws onto the shaft. It was shrink-wrapped from Mr Gasket this way, this was not the fault of Jegs.